Phil Brady was actually my inspiration to write about the different individuals of Georgetown. It’s taken me forever to get to him, when by all means; he should have been the first. However, as the old saying goes, “Good things come to those who wait,” and Phil certainly didn’t disappoint. He was worth the wait. I have gradually gotten to know Phil over the many years of being a Georgetonian. Each time we encounter each other, I find him more intriguing than the last time we met. I have known for years that he’s a genealogical historian however, as I was currently informed, he only gives lectures on his own family history. “Really? Did you get an invitation to the wedding?” I asked, referring to the Prince William and Kate Middleton gala. Even if he had received an invitation, I doubt he would have gone. Phil hates to fly and that would have been a long flight. Instead, he prefers to take the train when he ventures off into the wild blue yonder traveling. He usually walks all over town when he’s out an about at home so I’m guessing his preferred mode of transportation is his feet. In 2009, Phil graduated from Costal Carolina University with honors. “What degree did you receive?” I asked as I wrote some notes. “I have a degree in interdisciplinary study with a concentration in history, anthropology, and theater,” he answered. “Did you join the Swamp Fox Theater?” I was referring to our own actor’s group here in town. He’s also worked as a librarian while living in New York, and likewise in Fort Lauderdale, Florida. Phil is very active in several of his hobbies, which include, but not limited to, traveling, genealogy, anthropology, archeology, poetry, history, theater, magic and photography. Magic being his biggest forte as of late. My husband, Reese, and I keep meaning to pick up one of his magic shows and have yet to do so. 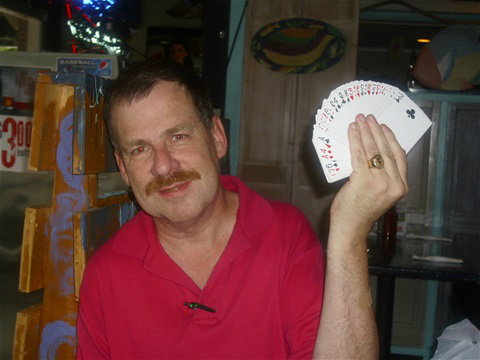 Phil often performs his magic at different events and/or businesses around town. He currently can be found at 700 Modern Restaurant on Front Street doing some of his magic tricks there. A few of the locals have said they’ve seen his act and he’s pretty good. I’d love to stop in one night for dinner and find him performing. If you have the fortunate opportunity of running into Phil while in town, stop and talk to him. He’s not only very intelligent and such an interesting person, he’s also quite friendly and outgoing. I do know this, if I want to know what events are taking place in town, I can call him and he’ll know about it. I even mention him being one of the town criers in my City of Georgetown blog. Suffice to say, Georgetown would not be the same without him.